Search: Title=egos Writer=moore - Westfield Comics - Comic Book Mail Order Service from Westfield Comics | Comic Books, Graphic Novels, Toys and more. 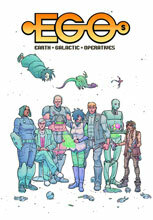 The chaotic super-team of the future must unravel a galactic mystery on two fronts: the lawless planet Tortuga and the stuffy halls of EarthGov. Collects EGOs #5-9 & #4.5.